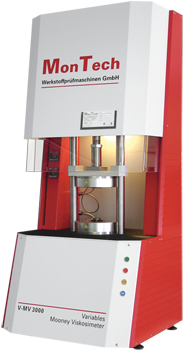 One of three models in the range, the MonTech Mooney Viscometer MV 3000 is the leading test instrument for measurement of viscosity, scorching and stress relaxation on polymers and rubber compounds. The massive aluminium frame of the MV 3000 with its 270° accessible die area allows easy sample loading while integrated rotor ejection simplifies rotor handling. Operation is made easy by 4 illuminated pushbuttons providing clear information about the machine state. A motorized safety shield separates the die area before the test sequence is started.